When Blackboard links have these two things, students will be prompted to log in with UND Credentials for off-campus access to the articles, and the library will be able to record usage of your departmental journals. 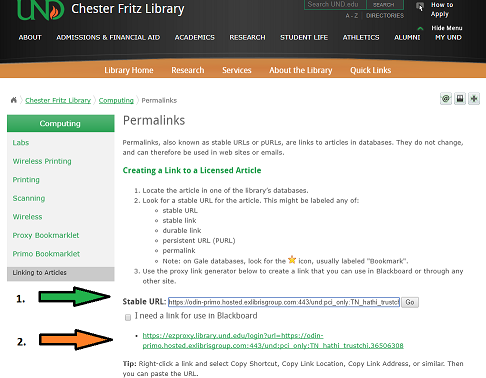 All* databases and links are available from the Chester Fritz Library webpage at https://library.und.edu. If you have questions about this, please contact your subject librarian or Ask a Librarian at 701-777-4629. 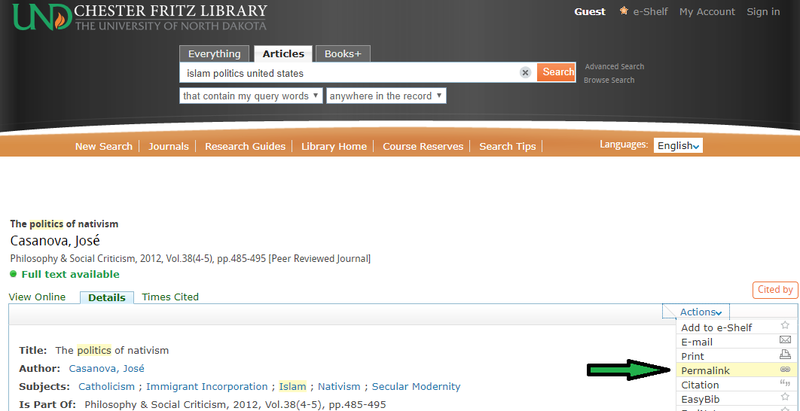 Databases such as Chester Fritz Library Articles Search, EBSCOhost and Credo do not have Permalinks as the URL but in a different spot. EBSCOhost: 1. Find & click at Green Arrow 2. To get a link at Orange Arrow.